A two-time All-American at Miami in 1974-75, Joaquim Rasgado literally has tennis in his blood. His parents, both avid tennis players, met on one of Brazil's red clay courts. being in constant contact with the sport since a young age, Rasgado a native of Rio de Janeiro, quickly became one of Brazil's premier junior tennis player and eventual National Champion. In his first year at Miami, Rasgado played in the number one slot (a position he would hold throughout his career) and qualified for the NCAA post-season tournament. Posting a 9-1 dual meet record in '74, Rasgado again qualified for NCAA post-season play, reaching the fourth round before being ousted. After graduation, Rasgado joined the professional touring circuit, and was a member of the Brazilian Davis Cup team. 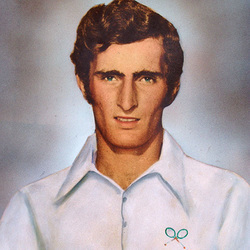 In 1981 Rasgado was named the Florida Men's Tennis Player of the Year. He has been ranked number one in the 35-and-over class by the United States Tennis Association since '88.